Emilee Ogden joined CCGD's staff in 2017 as Site Manager. Emilee is currently the President and Production Coordinator for a nonprofit chorus in Richardson. She has a background in orchestra and musical theatre, only recently entering into the choral world. Emilee serves on the children’s ministry staff at Highland Park Presbyterian Church. 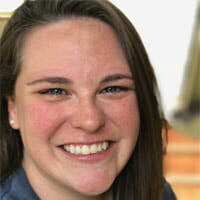 Emilee holds a Master of Arts in Children’s Ministry and a Bachelor of Arts in Educational Ministry and English from Dallas Baptist University. She’s currently pursuing a graduate certificate in writing from the University of Arkansas.